Community composting method-16: These composters can solve city’s dry leaves burning problem. Is BBMP listening? 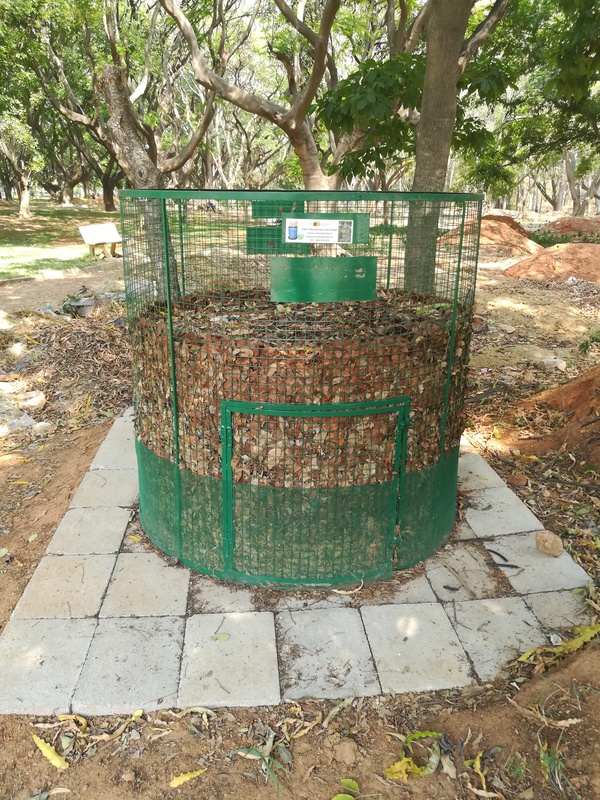 One of the Soil and Health’s leaf composters at Sobha Althea-Azalea, Bengaluru, busy doing what it does best: compost. Left to itself, Nature accomplishes everything at its own pace. All we need to do is create an atmosphere that does not harm its processes in any manner. These leaf composters sitting pretty in a community garden are doing just that: hold the substrate together and help the mesophilic bacteria make way for the thermophilic ones. As the latter travel towards the core, they churn out a bacterial bonfire and turn this otherwise unwanted load of leaf litter and garden clippings into lovely humus. For composting to happen, the first important step is to heap it up. Heaping up means heating up. When sufficient moisture goes in, the all-powerful-yet-invisible microbes begin to coax life out of that beautiful leaf litter. In a while, it’s time to scoop out black aromatic humus ready to enrich the soil in your garden. 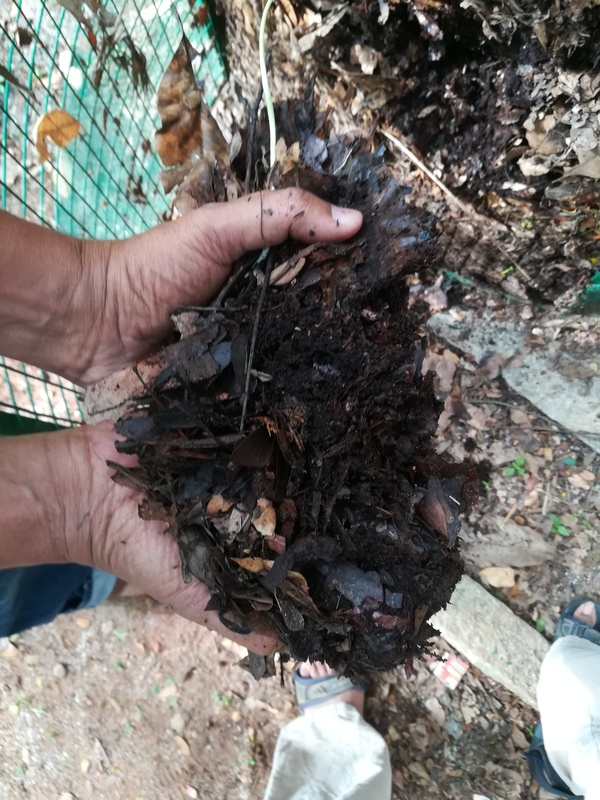 Simple, cost-effective and efficient, these leaf composters designed by Soil and Health borrow a lot from the traditional method of composting in rural areas. But unlike composting in a farm where rejects pasted with soil with troughs of animal dung thrown in and laden with moisture that the ground absorbs, composting solutions in urban areas demand a lot more attention-to-detail when it comes to design and durability. In the hinterland, constructing a barricade with bamboo poles or sticks around the heap itself serves as a solution. But not so in a cosmopolitan city like Bengaluru (or any Indian metro for that matter) where heaps of garbage merge themselves into the background effortlessly, but a solution such as this takes years for our civic authorities to think through. It’s especially disheartening in our Garden City. You can’t picturise or describe it without its trees! Nor can you separate a tree from its leaf litter and vice versa. But these days, it’s almost impossible to leave the stench of burning dry leaves out of any conversation associated with trees or leaf litter. But if you are someone who transforms leaf litter into humus, you know how to see a tree in its totality. And a composting tool such as this is all you need to bring yourself closer to that. The composters designed and sold by Soil and Health come in two sizes: 5ft diameter x 5 ft height and 3ft diameter x 4.5 ft height, with or without legs. However, Proprietor Vasuki Iyengar is not averse to customising. All composters are made using one-inch MS iron square mesh painted by green epoxy paint to delay rusting. An 8mm rough-cut sand mesh of up to four feet height runs from bottom-up to prevent rodents from digging in. There’s a hatch at the bottom to scoop out the compost as and when it’s ready. The larger ones have two hatches. The one without legs and base must be placed on cement blocks mainly to prevent rodents from finding their way in from the ground. For 5ftx5 ft composter, you will need 6ft L x 6ft B space. No roof required. In case of 3ftx4.5ft composter—known as Swacha Beedhi composter—you will need 3ftx4ft space. Preferably, these composters must be placed under a tree to prevent moisture evaporation, especially during summer. Five jute sacks should be spread on top to preserve moisture. 5ft dia x 5ft height, no legs: Rs 14,000 + transportation + 12% GST. Six Bioclean (a cocopeat-based accelerator) blocks of 5kg each, 1-litre EM (effective micro-organisms) solution, 1kg neem powder. To be setup on 50 cement blocks not included in the package. 5ft dia x 5ft height, seven legs and a base: Rs 18,000 + transportation + 12% GST. Includes six Bioclean blocks of 5kg each, 1-litre EM solution, 1kg neem powder. Swacha Beedhi composter, 3ft dia x 4ft 9 inch height, four legs and a base: Rs 10,000 + transportation + 12% GST. Includes three Bioclean blocks of 5kg each, 1-litre EM solution, 1kg neem powder. Swacha Beedhi composter, 3ft dia x 4ft height,no legs: Rs 9,000 + transportation + 12% GST. Includes three Bioclean blocks of 5kg each, 1-litre EM solution, 1kg neem powder. To be setup on 12 cement blocks. Not included in the package. “We have some customers who process their Bokashi pickle in our leaf composters. Bokashi pickle accelerates the process,” he adds. When leachate comes in contact with the ground, magical things begin to happen. The cow dung residue or the decomposing mass attracts grubs and earthworms which make their way through the gaps between the cement blocks and participate in the process as Nature dictates. 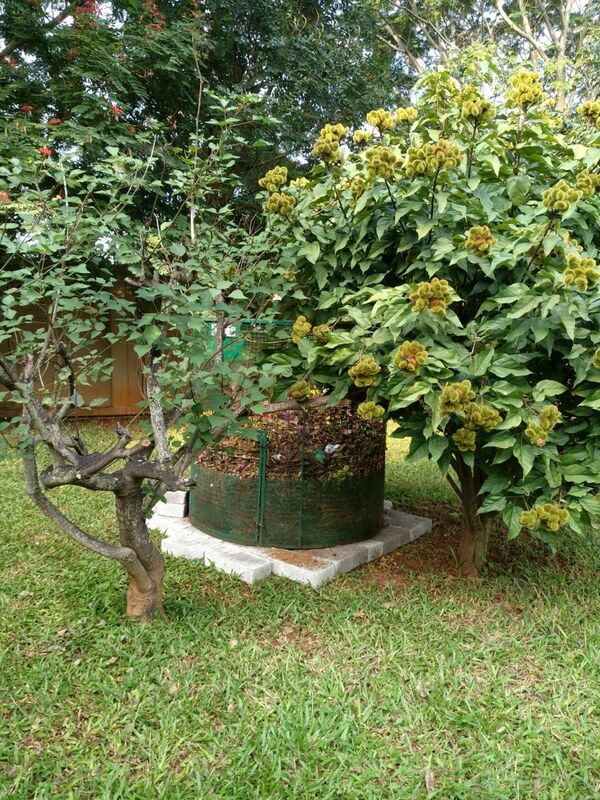 Of the 150+ composters sold so far, 25+ of them have found a home in temples. Another 25+ have been bought by Swacha Beedhi volunteers who adopt a street or a neighbourhood to compost whatever organic material they can lay their hands on. Similarly, several apartments and churches have also installed these composters. Above all, there are some dotting Lalbagh Botanical Garden and of course, Cubbon Park (see the slideshow above). The slideshow below shows a major harvesting session at Sri Shakthi Kalyana Mahaganapathi Temple located at Kalyana Nagar, Banaswadi. Phone: 94813 52125 / 98456 90778. 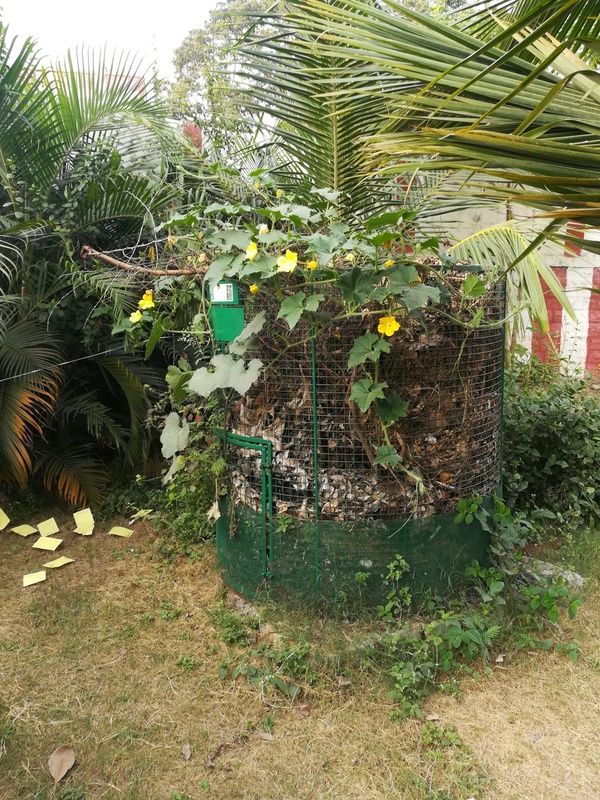 This entry was posted in Community Composting, Endlessly Green, Home composting and tagged community composting, dry leaves composting, Gary Snyder, leaf composter, Soil and Health, Swacha Beedhi composters. Bookmark the permalink. Vasuki , Good work , we in gurgaon had done a project with iamgurgaon in the biodiversity park and supplied at cost over 50 basic steel wire bins . It makes sense to get them fabricated locally as transport is the major deterrent. Thanks to your generous offer many more can consider at the lower cost. Savitha, what happens in the monsoons? The leaves would get soaked. Would that lead to a bad smell? No. Not if you let the earth absorb all the moisture. Only when it gets stored or stagnated at one spot, problems ensue. Savitha, Have gone in for WIRE MESH Leaf Composter. Is there any court order prohibiting housing colonies from sending out Leaf litter/ Coconut fronds/ cut branches ? Even if it goes out of a housing colony, where will it end up ? Is there any BBMP directive on leaf litter/ coconut fronds being sent to BBMP Garbage Trucks ? No such directive. Bulk generators are not supposed to send out any type of organic waste, be it kitchen or garden rejects. But sometimes it is difficult to process all the organic rejects in situ. If the quantity is beyond what you can handle, please get in touch with the corporator for help. Ma’am what happens if we just create a pile with kitchen waste and DO NOT add anything like dry leaves or composting accelerator? Will we get the compost or not? Nature takes care of everything eventually. But it will create a lot of issues like bad odour, worms, flies, etc. That’s the reason why it becomes necessary to process it in a certain way. This is aerobic composting (with air). Aerobic Bacteria need air – turning the mass would help. Compost needs Carbon and Nitrogen ratio of 10-30 : 1. Bacteria need eat to get on with their job of breaking down matter. Change in C:N ratio would effect the output. Carbon is any thing that burns (leaf..paper etc). Veg/ greens are Nitrogen. Wood/ sawdust is not recommended since wood has LIGNIN (sort of binder) that composting bacteria cannot handle. Kitchen waste incl cooked food would congeal and give off offensive smell if you don’t add a lot of Carbon in the form of dry leaves. why most of the startups about composting based ot of Bengaluru. It’s a question just out of curiosity. Because the activism began here post Mavallipura Mandur meltdown. Some thinking individuals came together and started a movement which is now a common feature all over India. Around the same time, some young innovators came forward and invented solutions. Yes, Bangalore will remain the champion when it comes to these innovations.